A volcanic performance by Raúl Esparza outshines the flaws in this revival of Brecht’s allegory play. Lane Williamson reviews. Did you know the world is going up in conservative flames? Comparisons between Trump’s rise to power in 2016 and Hitler’s in Germany in the early thirties show up in my social media feed constantly and the parallels are never less than harrowing. 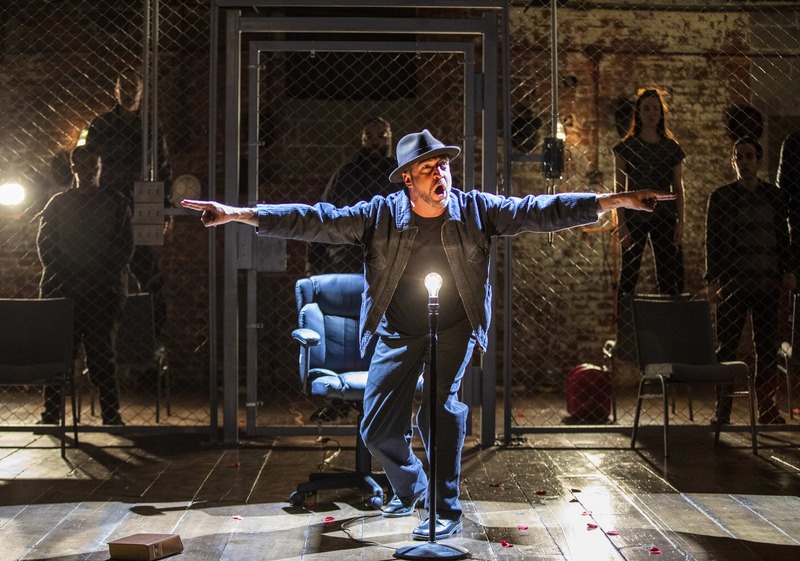 Classic Stage Company aims to theatricalize this mirror-imaging with a new production of Bertolt Brecht’s The Resistible Rise of Arturo Ui, a 1958 allegory play (first written much earlier) that substitutes gangsters and cauliflower for Nazis and the persecuted. John Doyle’s production is frequently chilling, but is occasionally so obvious it hammers in a nail that’s already been driven. We East Coast liberals are too aware of the fascist overtones in Trump’s rhetoric to not immediately recognize them in play, but that doesn’t stop Doyle from making absolutely sure we get it. Brecht’s play uses interstitial scene titles that announce the actual events in Nazi Germany that he will then satirize with his fictional cauliflower trade plot. It’s a common device from Brecht’s theory of distancing to say clearly what the point is and then depict it with fictional trappings like character and narrative. Brecht calls for these titles to be projected and read by the audience, further removing the Hitlerian from the Uiian. Doyle has them spoken into a microphone like public service announcements, which doesn’t have quite the same effect. Doyle and sound designer Matt Stine later use historical recordings from Nazi rallies (“sieg heil” on repeat) as Ui ascends his cauliflower throne. This soundscape is repeated in a climactic speech at the end of the play where the Nazi salute is replaced by chants of “Lock her up,” still heard at Trump rallies two years after his election. These moments of sound design are at odds with the aesthetic Doyle has created around the rest of the play. There is no music – scene transitions are performed in silence with actors dropping character into a neutral state and flicking on and off a series of fluorescent lights overhead. The silence is eerie, because we are accustomed to having such moments covered by carefully chosen tunes or having the transitions eliminated completely as scenes bleed into each other. Had Doyle doubled down on this strange quiet with projected scene titles (also silent), the growing discomfort would have been all the more apparent. The rally cries, likewise, come out of a void of silence and the isolated incidents of pre-recorded sound are at odds with the plain-spoken dialogue coming from the actors. The physical production also does little to help establish time or place. Doyle is also the set designer and has placed the play in what appears to be a warehouse break room with a large chain link wall and white plastic folding tables. The costumes by Ann Hould-Ward are shades of gray and black and include hoodies and tank tops and a variety of styles of hat. It all adds up to a hodgepodge style that has little to do with the events of the play and goes nowhere in illuminating character or situation or in achieving the alienation Brecht calls for. Doyle has the actors undertake a type of acting similar to the fast-talking, wise-guy style of 1930s gangster films. This is perhaps the most Brechtian device he employs in the production. In Brecht’s theory, he calls for a heightened mode of acting that is at odds with the naturalistic styles popularized by Chekhov and Stanislavski right before Brecht was working. In his view, the acting should be exaggerated and should remind the audience of the craft behind it. The screwball side-of-the-mouth acting employed by this company captures that method of alienation better than I have ever seen by an American company. In particular, George Abud in his variety of roles (most of the actors double or triple) brings a believability to the acting style that accomplishes the Brechtian disconnect while remaining truthful in the moment. As Arturo Ui, Raúl Esparza delivers a tour de force performance that completely outshines the production around him. Esparza begins the play in a swath of Brooklynese vowels and cadences and, in a breathtaking scene with Elizabeth A. Davis as a classically trained actor, learns how to walk, how to orate, and how to sit with power. Esparza shows us the creation of a madman from the toes up. He negotiates the shift with incremental steps until they all coalesce and it’s gone too far to turn back. In the two hours Esparza is on stage, he captures a microcosm of the Hitler-Trump avalanche and we are all powerless to stop it. The play is bookended by a prologue and epilogue in which the company of actors sets up the moralistic world in which the play will take place. The epilogue comes immediately after a titanic speech by Esparza and it all feels resigned until the play’s final sentence, also spoken by Esparza, sends an electrified jolt through the audience. I won’t spoil it, but George Tabori’s translation – unaltered here since its 1964 premiere – is uncannily prescient and this single sentence is more effective than anything Doyle does in the production to connect Ui to the real life dictators. Extra stuff be damned, Brecht’s text does it all in a single line.